D: After leaving this Ashram in October I was aware of Bhagavan (Ramana) peace enfolding me for about ten days. All the time while busy in work there was an undercurrent of that peace of unity; it was almost like the dual consciousness while half asleep in a dull lecture. Then it faded out entirely, and the old stupidities came in instead. Work leaves no time for separate meditation. Is the constant reminder “I am,” trying to feel it while actually at work, enough? M: It will become constant when the mind becomes strengthened. Repeated practice strengthens the mind; and such mind is capable of holding on to the current. In that case, engagement in work or no engagement, the current remains unaffected and uninterrupted. 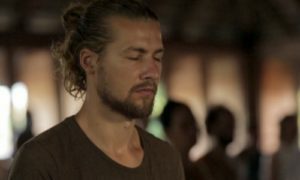 D: No separate meditation is necessary? M: Meditation is your true nature now. You call it meditation, because there are other thoughts distracting you. When these thoughts are dispelled, you remain alone, i.e., in the state of meditation free from thoughts; and that is your real nature which you are now attempting to gain by keeping away other thoughts. Such keeping away of other thoughts is now called meditation. When the practice becomes firm, the real nature shows itself as the true meditation. D: Other thoughts arise more forcibly when you attempt meditation. M: Yes, all kinds of thoughts arise in meditation. It is but right. What lies hidden in you is brought out. Unless they rise up how can they be destroyed? They therefore rise up spontaneously in order to be extinguished in due course, thus to strengthen the mind.